Posted on February 3, 2010 by Dallas. Filed under Entrusted With Arrows and tagged as Greg, Postproduction, prayer. No Comments. The locked version is in the hands of our composer, Jurgen Beck. Please pray for Jurgen’s wife, Shawn, as she is now recovering from surgery for breast cancer and for creativity and wisdom for Jurgen as he composes the score. We now have a few other items to take care of. We are refining all the text portions of the film, which is relatively easy. One of the most difficult jobs is “cleaning sound.” One of our interviews had an air conditioner running in the background, which gives a very loud hum. When cutting in and out between others’ interviews this hum is very noticeable, so we are taking on the job of removing it. This is a very difficult process and usually leaves an unnatural vocal tract. I think of it as an icy sound with lots of pops and other artifacts. Others liken it to recording in a glass bottle. We need prayer on this one! We are also working on the special features and trailers. The special features will include a full interview for each family. This will be full of the wisdom that had to be edited out of the main feature, so I’m hoping people will take the time to watch these! Posted on January 23, 2010 by Dallas. Filed under Entrusted With Arrows and tagged as Greg, Music, Postproduction. No Comments. Yes! We have finished editing and have sent our locked version to our composer, Jurgen Beck, for the score. A locked version is basically a promise to the composer that we will not tinker with any of the time code, so that he can confidently do his work. Dallas still has a small amount of work to do with the graphics and text, but this won’t change the timing of what we sent to Jurgen. Next is work on a trailer and special features. I am working on the script of our next mini-project, an educational film about the definition of urban and rural. We have a goal of pre-production, filming and post in one week. We’ll see! We are also brainstorming for a new major project. Our goal is to be increasingly time efficient! Posted on January 20, 2010 by Dallas. Filed under Entrusted With Arrows and tagged as filming, Greg, Postproduction. No Comments. Last week we recorded the final take of our “readers.” Dustin’s good friend, Jason Buzzard, has a nice deep, resonant voice and did a really nice job of reading the male voice. Shauna (my wife, Dallas’ mom) did the female voice. Throughout the film there are quotes from the web, books and scripture. Their job was to put voice to the text as the viewer reads it. Thank you Jason and Shauna! I wish we had taken a photo of your recording sessions! We also found a fairly major mistake in time to correct it. One piece of the host’s narration was in the wrong place and the piece that was supposed to be there was never recorded! It was good to find this in time to correct it. 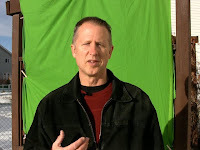 We had a mini-taping session in the backyard in front of the greenscreen, which enabled us to put me (the “host”) in the downtown setting where the rest of the narration takes place. We did it outdoors to have the same lighting as the sun shone in my eyes, making me squint. :0) Fortunately, it was only a few sentences and Dallas did a great job of making it fit right in! Posted on January 10, 2010 by Dallas. Filed under Entrusted With Arrows and tagged as Greg, Postproduction. No Comments. Today we went out to Erdmans’ farm to “shoot” Daryl “shooting.” Arrows, that is. We needed a model to shoot for a silhouette of a warrior archer in the act of shooting. We found a nice outcrop of sandstone with bare trees behind. Very nice shot, I think. 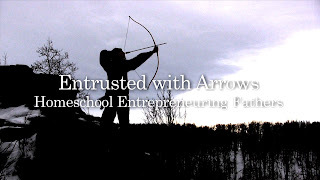 Dallas will be taking the footage and adapting it for the title sequence of Entrusted with Arrows. We are very close to a locked version, which we will send to Jurgen Beck for the original score. Posted on December 17, 2009 by Dallas. Filed under Entrusted With Arrows and tagged as Answers to prayer, Greg, Postproduction. No Comments. We forgot to tell you that last week we got our edit down to 57 minutes! Exciting! (For us anyway :0) ) This took a lot of prayer and thought, as our “interviewees” gave us such wonderful material to work with. The difficulty was deciding what NOT to use. Very difficult! 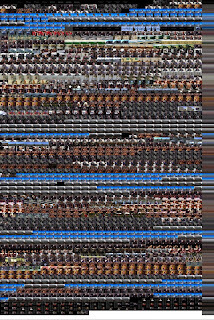 It’s a rather unique link we have built with each person we interviewed, as we daily watch and listen to what they had to say as we edit. It is painful each time we have to hit the delete button! We have decided that because there is so much helpful material, and that no audience wants to watch a three hour documentary, that in our special features we will have a mini-documentary for each family. Unfortunately, we are not able to use the children’s interviews in the main feature – we’re sad about that! But we will include them in the special features mini-docs. I feel badly when we have someone do an interview, then we don’t use it. It feels disrespectful to what they had to say. Hopefully people will watch the mini-docs and benefit from the wisdom and experience these people have to share! We now well on our way to inserting “B-roll” over the interviews. Dallas has created a new “Documentary Snapshot” that has a bit of a different look than it did in November. This due to the new B-roll and the narration placeholders. (We have a still shot of our location covering a rough reading of each narration sequence.) Compare to November 23. Dallas says to tell you that if this one looks longer, it’s because it has a more frequent frame capture. Help us with our title! Posted on December 8, 2009 by Dallas. Filed under Entrusted With Arrows and tagged as Greg, Postproduction. No Comments. Can you please help us with our title? Please follow this link to a survey about which title to use. Posted on December 7, 2009 by Dallas. Filed under Entrusted With Arrows and tagged as Greg, Postproduction. No Comments. As we work in postproduction, the following is our guide to help us with those difficult editing decisions. Purpose: to challenge Christian men to take up the responsibility that God has entrusted to them, namely to be the spiritual leaders in their homes, to train up their children in they way they should go, so when they are old they will not depart from it. Our prayer is that, whether they choose to homeschool or develop a home business, they will choose to step up to their calling to be vigilant in their role as spiritual leaders. Synopsis: This film highlights the efforts of a few Christian men who take extreme measures to directly train up their children in the way they should go. 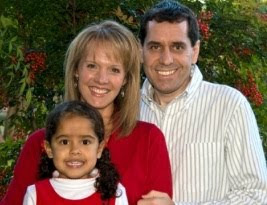 They do this by not only educating them at home, but by developing businesses which allow them to be with their children on a regular basis, living side by side with them, following the commands of Deuteronomy 6.